I recently got back from an epic bucket list hiking trip out to the American Southwest – one in which I was able to strike three destinations from my bucket list and my husband was able to strike one destination from his bucket list. Southern Utah would serve as our home base, but our trip began with a flight to Las Vegas. It may not seem so, but Vegas is the closest major airport to destinations in Southern Utah and Northern Arizona. There’s no easy or straightforward way to get from one place to another out there due to the terrain, so you are better off flying into Vegas and driving the couple of hours into Utah. In our case, it was around three hours to our home base in Kanab. Here’s a map of our week in the Southwest. We managed to clock 1,042 miles on the rental car during our eight-day trip. Speaking of Kanab, the town was a perfect home base for a few reasons. First, its location is situated perfectly between the major national parks we wanted to see: Zion National Park, Bryce Canyon National Park, and the North Rim of the Grand Canyon. It’s also close (about an hour west) to Page, Arizona where we were to see Horseshoe Bend and Antelope Canyon. Kanab’s downtown is small but there are some great, locally-owned stores and restaurants there. We stayed in a chain hotel that was right next to Kanab United Drug, a cute little non-chain drug store adjoined to a soda fountain. Just down the street was our favorite restaurant, Houston’s Trail End Restaurant, that serves home-cooked meals with fast service. A few blocks farther is the locally-owned Glazier’s Market for trail snacks and other supplies. Angel’s Landing at Zion National Park has been on my bucket list for a while now. It’s a really tough hike and is also one of the most popular hikes in the park. However, we started our first day on the ground in Utah getting our bearings at Zion. During peak season, the park uses a shuttle system outside and inside the park (two separate bus lines) to help with the vehicle congestion. As most guidebooks said, you are better off parking in the nearby town of Springdale and picking up a shuttle bus if you plan to arrive any later than 9:00 a.m. Our trip was at the tail-end of busy season and yet parking was still a challenge inside the park. Our first hike in Zion was to Upper Emerald Pool.The trailhead is located across the street from Zion Lodge. It is a three-part hike to Lower Emerald (easy), Middle Emerald (moderate), and Upper Emerald (strenuous) with a total of +350 feet of elevation change. The trail takes you past three waterfall points. It had been a dry period prior to our arrival, so only the Lower Emerald Pool had a small trickle. A small trickle at Lower Emerald Pool. We had no majestic waterfall sightings on this two-hour hike, but it is a decent climb with nice views if you want to test your legs. Taking photos at Upper Emerald Pool. A few days later, we returned to Zion for the big hike: The hike on West Rim Trail and the climb to Angel’s Landing. I write more specifically about how to hike Angel’s Landing in this post. Suffice it to say, the prevailing advice was true. 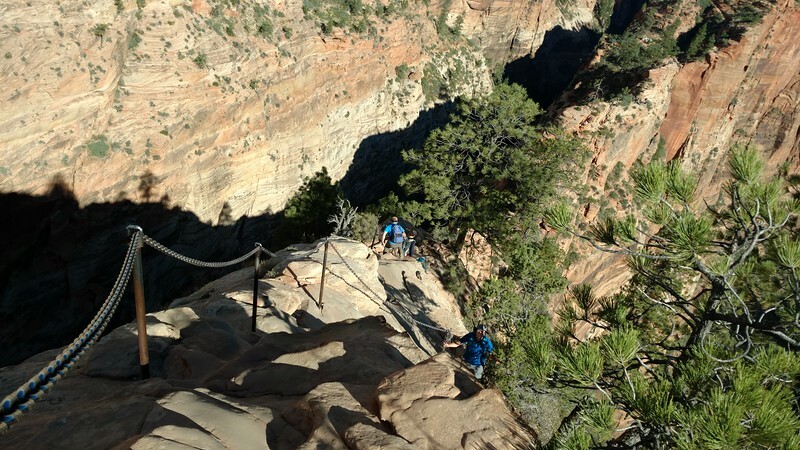 Angel’s Landing is an iconic hike, but also a dangerous one. You have to be alert and not do anything stupid if you don’t want to hurt yourself or someone around you. To give you an idea of what the hike is like, here’s a shot from the hike up to Angel’s Landing as you look back across one of the several fins that you have to cross. Want to know more about hiking Angel’s Landing? See my detailed post about this tough but amazing hike. You can also view the photo gallery from our two days at Zion. 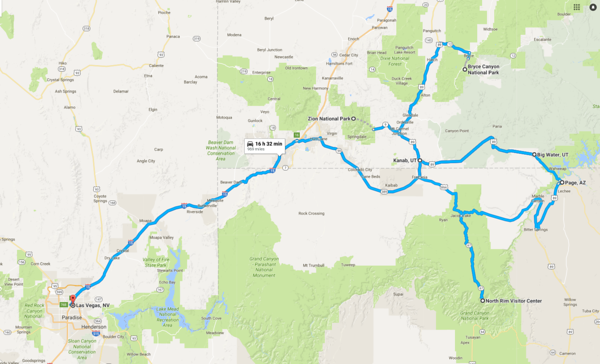 We had an ambitious schedule for the week, so we only had one day allotted to see Bryce Canyon National Park. We chose to drive the scenic road through the park, starting with Utah’s scenic byway 12 that leads you to the park entrance. Driving this route would give us a good overview of the park. 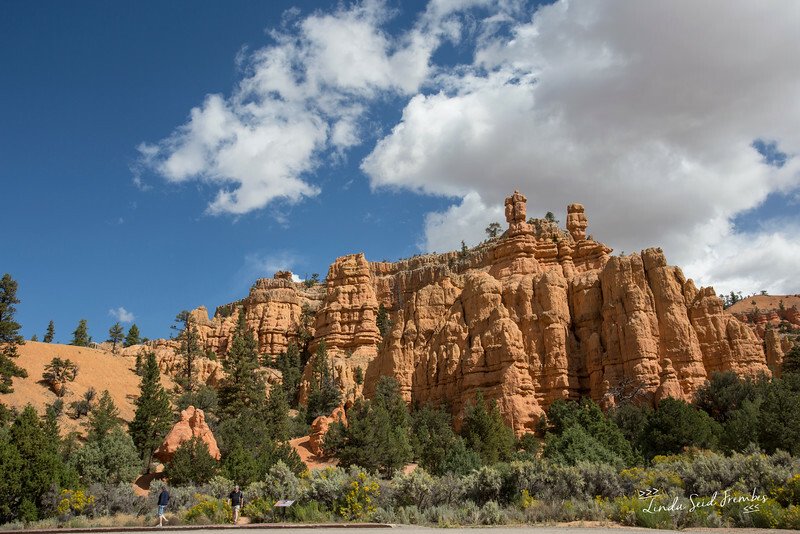 After a quick stop at the visitor’s center, we drove to the end of the 18-mile (one way) scenic road that takes you to the major viewpoints in Bryce Canyon National Park. Most of the viewpoints are on your left as you exit the visitor’s center so, to make our lives easier, we drove to the final viewpoint and made our way back toward the entrance. This kept us from waiting to make a left turn as we departed each viewpoint. Navajo Loop Trail in Bryce Canyon. There were three stops that stood out to me as must-sees. The other stops were wonderful but began to look the same to me. First, the stop at Sunset Point to see Thor’s Hammer (above) is worth the stop. You can pick up the 1.3-mile Navajo Loop Trail if you want to walk down and see the Hammer up close, or you can stay up top and walk the rim. Both are breath-taking. Second is the stop at Natural Bridge, one of several arches in the park. This one is very close to the parking area and is accessible to all. There are no trails to walk closer to the arch, but you can get a nice look at it from the viewing area. Third is the stop at Inspiration Point. It is a short climb to an amazing viewpoint of the Bryce Canyon Amphitheater. You can view the photo gallery of our day in Bryce Canyon. Remembered how I mentioned before that Kanab, Utah is the perfect home base? You are only a few miles from the Arizona border when in Kanab, and approximately an hour and a half from the North Rim of the Grand Canyon. The North Rim is the quieter and lesser traveled rims of the Grand Canyon, but it is no less spectacular and stunning than the busier destination to its south. We chose to make this a day trip from Kanab – leaving early and coming back in the not-too-late evening. When we arrived at the North Rim Lodge, it was evident that the lodge was more analog and digital. (That is *not* a knock against it, by the way.) The lodge is small – much smaller than the facilities on the South Rim – and the activities are mainly hiking the trails or grabbing a mule ride. 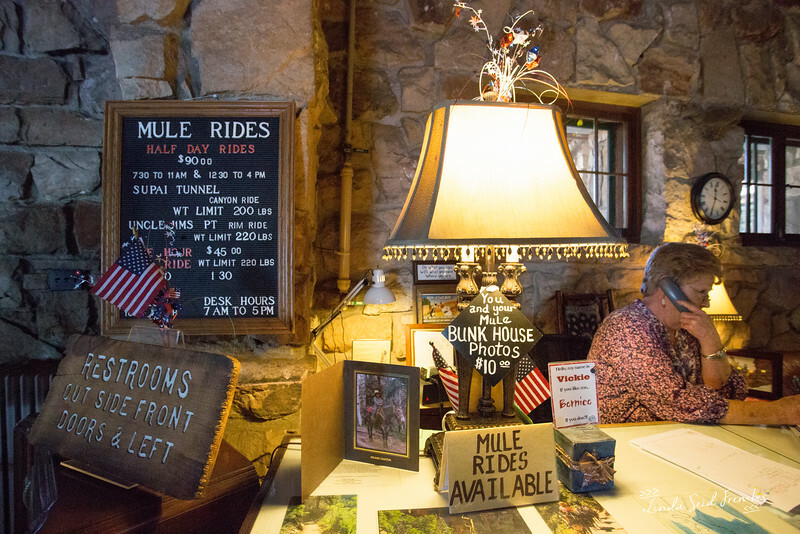 We stopped for a quick lunch in the Lodge dining room and were able to hop on the 3.5 hour mule ride down to Supai Tunnel. Riding a mule into the Grand Canyon has always been a bucket list item for my husband and I was so glad that the timing worked out! Similar to our experience on the South Rim, the guides are skilled professionals who wrangle livestock for a living. Our particular guide, Mark Williams, was a true cowboy who was born into the family business of cattle farming. Resting the mules at Supai Tunnel before we ascend out of the canyon. What an amazing experience; one that I will never forget! Next stop on this whirlwind bucket list trip was a stop at Horseshoe Bend in Page, Arizona. It is such an iconic view and a stop here has been on my bucket list since the very beginning. Sitting at the edge of the cliff, you get a full view of the Colorado River as it meanders ~1,000 feet below you. The short 1.5-mile walk from the parking area isn’t strenuous, but be advised that it is an exposed walk the entire way. There is no shade, so wearing sun protection like a hat and bringing water is always a good idea. “Bruce the Shark” rock formation in Antelope Canyon. Last, but not least, was a tour of the iconic Lower Antelope Canyon, also in Page. 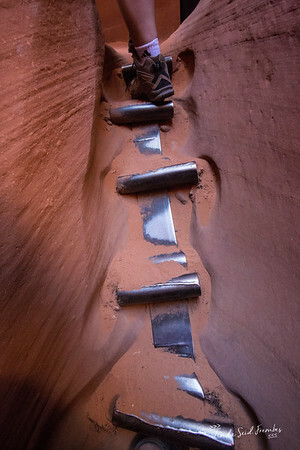 Folks who may not know Antelope Canyon have probably seen some of the amazing images that are made there. The colors and swirls of the canyon rock are unmistakable. Our tour was reserved in advance via Ken’s Tours, one of several tour operators who lead groups into Lower Antelope Canyon. The tour groups are run like a well-oiled machine. There isn’t much planning required other than making a reservation. What surprised me most was the sheer number of people waiting to get into the canyon. Here’s a shot from the short walk to the canyon entrance and folks waiting on the metal stairs that lead into the canyon. You are constantly in close proximity to people from beginning to end, which is fine. After all, you’re here to look up. As for accessibility, this tour wasn’t strenuous but there is climbing of ladders, stairs, and footholds like the one above. There are also some tight spots but nothing that is dangerous or threatening. If you can make it out to Page, Arizona, then Antelope Canyon (there is Upper and Lower) should be on your list. Dying to go to Utah! You should go! I’ve been twice and love it there. So beautiful and nothing like it! I know! I’ve heard it’s amazing!